This week, we were lucky enough to chat with Wondercide customer Diana Lott, an Austin photographer and pet-owner dedicated to a natural lifestyle for herself and her four-legged friends. We got the inside scoop on everything from raw feeding to traditional Chinese medicinal herbs and heard about how natural pet care has majorly improved her life. 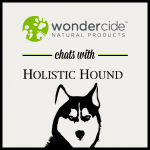 Wondercide: How did you get into natural pet care? 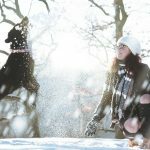 Diana: In my early 20s, I started out doing everything mainstream with my pugs Aries and Earl. For about 6 years, I fed a low-quality kibble and did essentially whatever my vet suggested, no questions asked. Earl eventually developed allergies that made his skin flake so much that his coat looked gray instead of black! I started to do my own research and looked into dog allergies. I realized it was likely the high level of grains in the food that was causing him to be so itchy. First I switched to a grain-free kibble and that helped a lot…then I discovered raw-feeding. I decided to give it a shot. I started out slow, feeding half raw and half kibble (but not in the same meal! ), then I switched to exclusively raw food. Earl’s allergies completely disappeared. It all started with figuring out the appropriate food to feed my pugs, and that led to me taking a harder look at everything that went into their care. I switched them off of toxic flea and tick treatments and really made sure everything in their life was as natural as possible. Both of them lived to be nearly 17 years old (RIP babies!). Wondercide: What benefits have you noticed from taking a natural approach to pet care? Diana: The most significant difference is the much reduced vet bills; we really haven’t had any of the health issues that most dogs get in older age. My pug Boz is about to be 11, and he still acts like a puppy! On the other hand, I see other dogs his age and younger that are pretty much falling apart. Even having so many pets (I have 4 dogs and one kitten named Kevin), we haven’t had any instances of cancer, which is so common now in dogs – just like in people! I’ve also seen great results in my foster dogs. It’s so rewarding to see animals who are really sickly and stressed from shelter life turn around so quickly on a raw diet and living a natural lifestyle. I’ve been rescuing animals for about 15 years now, and it’s possible a raw-fed rescue could be in my future – we’ll just have to see! Wondercide: What other natural pet care solutions have you incorporated into your lifestyle? Diana: Lily, one of my rescue beagles (I have two! ), had a pretty bad case of heartworms when I adopted her. I wasn’t sure she would live for more than 6 months, and she’s now been with me for over 3 years. She started out on steroids to control the inflammation in her lungs from the heartworms, but I didn’t feel comfortable with the potential side effects and dependency issues. I met with a vet that specialized in traditional Chinese medicine, and she got me on some herbs for her condition. So far, it has worked as well as – if not better than – the steroids. I also use turmeric, hawthorn, and essential oils. Once a year for a few weeks, I use diatomaceous earth in the dogs’ food for natural deworming. I use flower essences for my dog Cajun to relieve his anxiety symptoms (he’s a crazy Louisiana beagle!) and Goldenseal as a natural antibiotic as needed. Wondercide: What tips do you have for someone who is new to natural pet care? Diana: I think that the most important thing is nutrition, and I believe raw is best – even if you can only do it half the time. People often feel like it will be too expensive or too challenging. I won’t say it’s as convenient as kibble, but once you get the basics down, I think raw feeding is really simple and the best thing you can do for your pet. The other thing is getting them off of those toxic flea and tick treatments, especially the topical ones you get over the counter. You can really just bathe your dog if you see a flea (let them stay soaped up for 10 minutes – it suffocates the fleas!) and use Wondercide for maintenance. I sometimes have 5 or 6 dogs here when I foster, and we’ve never had a flea infestation. I’m not using any of the traditional products. 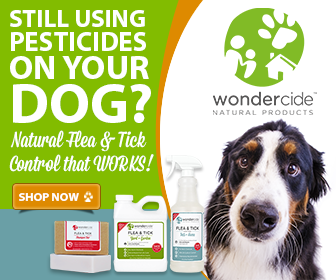 Wondercide: How long have you been using Wondercide’s natural flea & tick prevention? Diana: I’ve been using Wondercide for a couple of years. Another raw-feeding, holistically-minded friend told me about it, and I bought some and tested it out. I had a foster dog come into the house with a ton of ticks. There were so many that I didn’t get them all after several baths, and a few escaped. We then had a tick problem, so I was looking for anything that would work (without resorting to toxic chemicals). I tried 8-10 different essential oils by placing a drop on each tick, and then I put Wondercide on the last one – all the essential oils took at least 6 hours to kill the ticks, and Wondercide killed almost immediately. I use Wondercide 2x per week on all the dogs, especially since I just adopted a kitten, who, along with his feral brothers, brought in some fleas. And I also spray the dog beds whenever I feel they need it. Wondercide: Anything else you’d like to share with our readers? Diana: For me, seeing has been believing. I’ve had such great results that I’m confident this is what’s best for my pets. I’ve convinced half a dozen people or so to switch to raw feeding their pets because they’ve seen the results in my dogs – and how much they love it! It also helps that they have seen me feed them; it takes the mystery out of it, and they realize it’s really not hard to do. I think if people would just give it a trial run, they’d see for themselves and be on board. Wondercide: Thanks so much for talking with us, Diana! It’s great to talk to customers who totally “get” us and what we’re all about at Wondercide. Do you know a Wondercide customer who’s really into natural pet care? Let us know in the comments, and s/he could be our next Customer Spotlight! I am a “natural” Texas girl myself. When I rescued my first puppy it was love at first sight and I couldn’t bear the thought of putting anything harmful into his body. 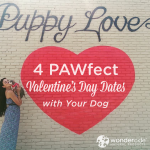 I scoured the internet reading articles about holistic pet health – shout out to Dr. Mercola – and that’s how I stumbled across Wondercide. Thank you so much for making a flea and tick control that is so easy to use and healthy. This product has worked so well for us that sometimes we forget to use it. I especially love the soap bars! Thank you also for publishing these customer spotlight stories. It’s nice to feel you are not alone in a sea of mainstream and to get valuable information from other pet owners. Keep up the good work! Hey Kelly! Thanks for the positive feedback! We’re thrilled you found Wondercide and that it works so well for you. If you ever want to share your story in a customer spotlight, feel free to send us an email to info@wondercide.com! I started using Wondercide last April when I had a horrible flea infestation in my basement and all of the cats were scratching like crazy. I did not have great luck with the topical spray for the cats, so if you guys and girls could find it in your hearts to develop something that you could apply like you do the “other flea treatments,” or a non-toxic flea collar, I would greatly appreciate it. I did, however, have great results with the Wondercide for indoors. It truly was a lifesaver for me as I did not want to be spraying poisons all around the house. I love the products and I am quite used to the smell of cedar now, and it does not bother the cats at all. One more thing. If you could make a product that you could use to clean floors with that helps with the fleas, I would love that as well. Thanks for developing these products. Hi Betty! Thank you for your feedback. If you have tried Wondercide on cats and continue to see fleas on them, it means that they are continuing to pick up fleas from their environment, so your home also needs to be treated. It looks like you figured that out on your own, though, and we are happy to hear that you had great success using our indoor products. Since cats are quite sensitive, it’s always great if you can keep the home flea-free with Wondercide so you do not have to frequently treat your cat. The “other flea treatments” that you mentioned generally work by absorbing into the pets’ bloodstream. Fleas are killed when they bite your pet and consume toxins that are in the cat’s (or dog’s) blood! Because we are dedicated to protecting pets without the use of harsh chemicals, our products are intentionally different than the mainstream toxic treatments. While we don’t have any repellent cleaning products at the moment, we do offer an organic soap bar called Repel that is formulated with citronella and geranium oil to keep pests at bay!